Vung Tau is the closest beach town to Saigon, so naturally it’s a popular city escape for Saigonese. The easiest way to get there is by the fast boat service. This used to be the quickest way before the Long Thanh expressway opened. Now getting a minivan takes about the same time. 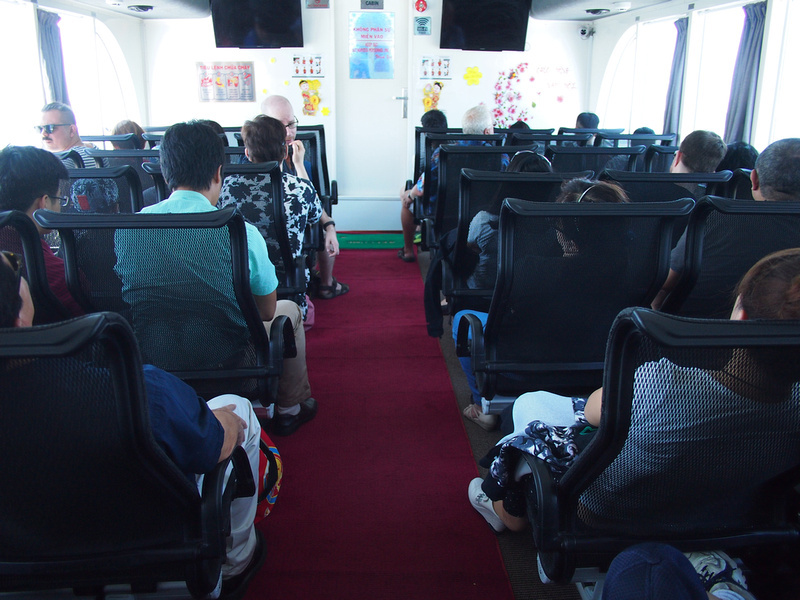 There was some confusion over the future of the ferry after the Vina Express hydrofoil caught fire in 2014, and services were suspended. 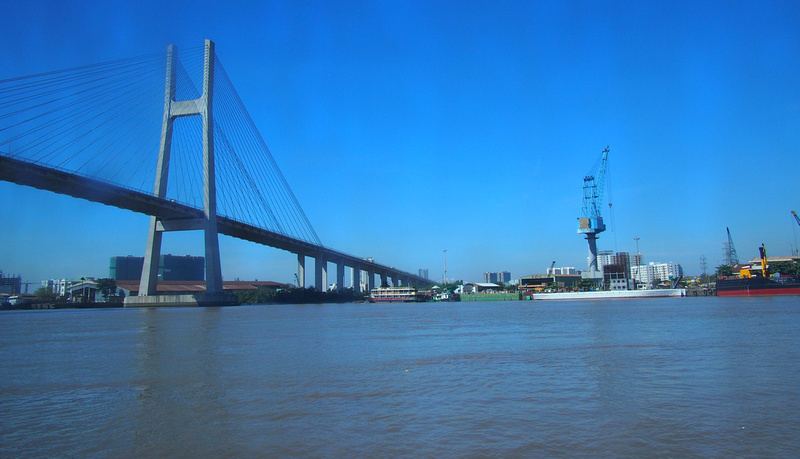 The service restarted but then the government announced that the Soviet-era hydrofoils used by Vina Express were to be retired by December, 2016. There are now other operators so this isn’t the end of the Vung Tau ferry. Vina Express was the hydrofoil operator whose service has since been suspended. The other two operators are Pacific Express and Greenlines. The tickets are the same price and from the same location, so I went with Greenlines for the departure time that suited me. 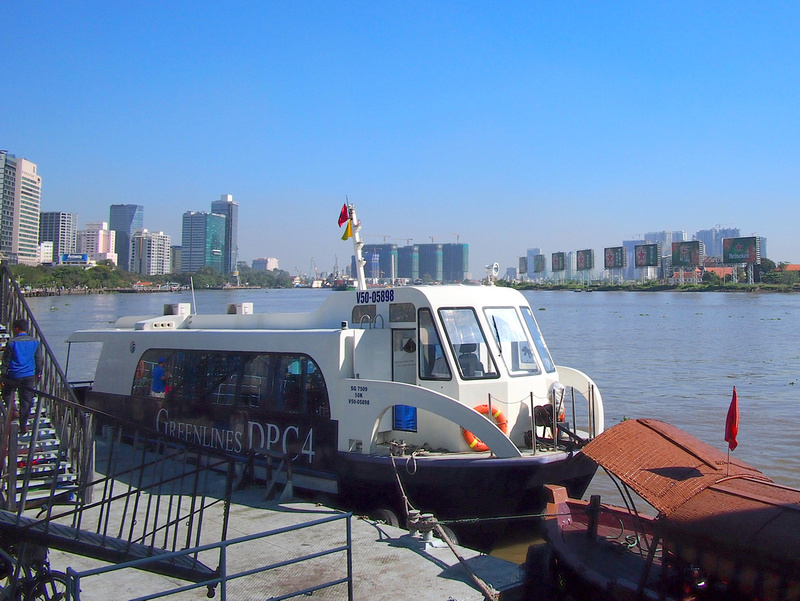 When I went on this trip the ferry departed from District 4 off Nguyen Tat Thanh Street near the Ho Chi Minh Museum. 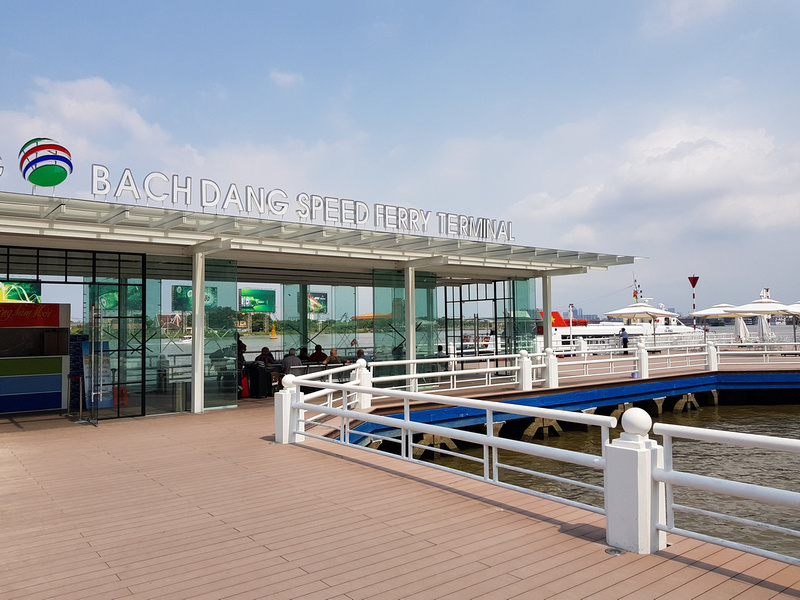 In March, 2018 the ferry departure moved back to District 1 at the Bach Dang Speed Ferry Terminal. This is opposite the Riverside Hotel on Ton Duc Thang. The Greenlines catamaran looks like a little tug boat so I was surprised at how fast it goes. 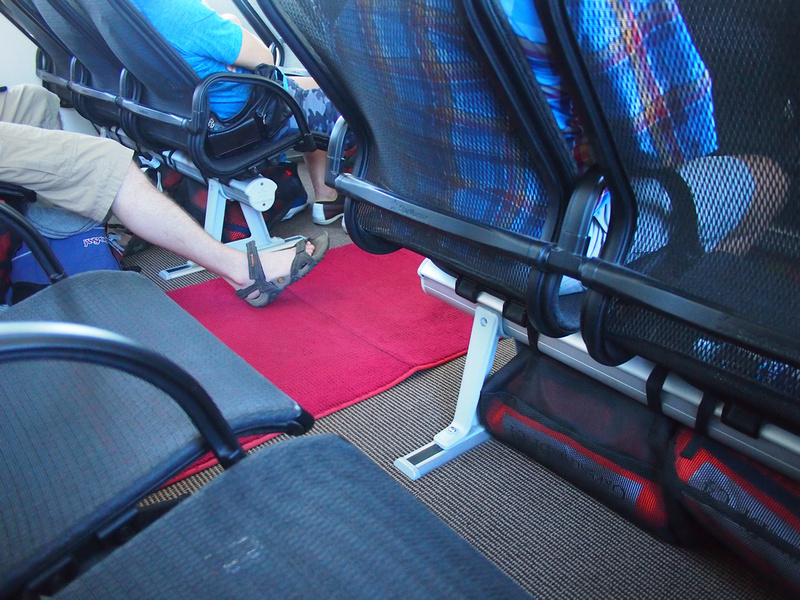 I’ve been on many ferries in Southeast Asia with narrow and broken seats. It was a welcome relief to see that the seats weren’t crammed into a small space. The seats are wide and provide plenty of leg room, and they are made of a soft netted/mesh fabric that are comfortable to sit on. The life vests are easily accessible from under the seat as well. There is wi-fi onboard and video entertainment. 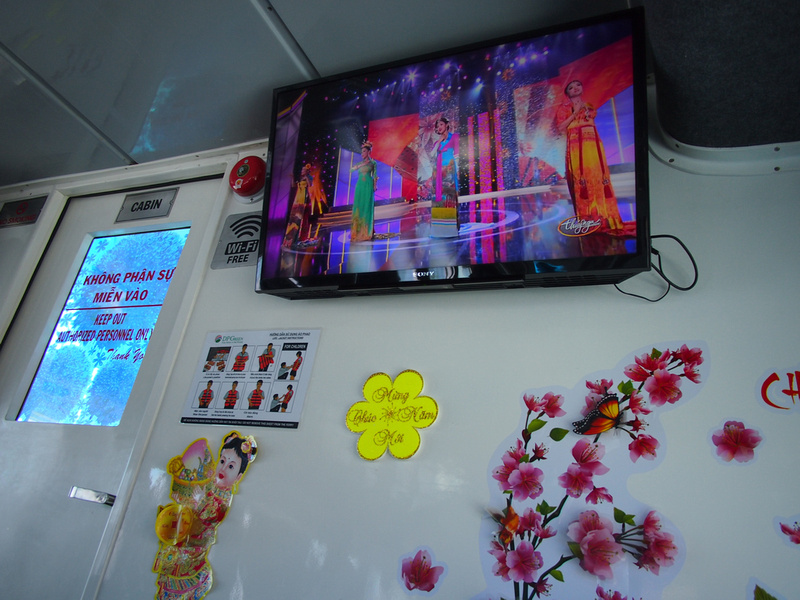 They were playing traditional Vietnamese music and it wasn’t too loud, which is usually the case. They also had the air conditioning set at a reasonable level and not set to “freezing”. Part of the appeal of this trip is putting Saigon in context to the surrounding waterways. While the rivers the boat travels on aren’t part of the Mekong Delta, there are sections that felt like being in the Delta. Being in urban Saigon I didn’t realise how big the ports and waterways were here. There is a small deck out the back but it’s not really suitable for sitting. This a fast boat service and not a pleasure cruise, so I made do with looking at the scenery from the window. 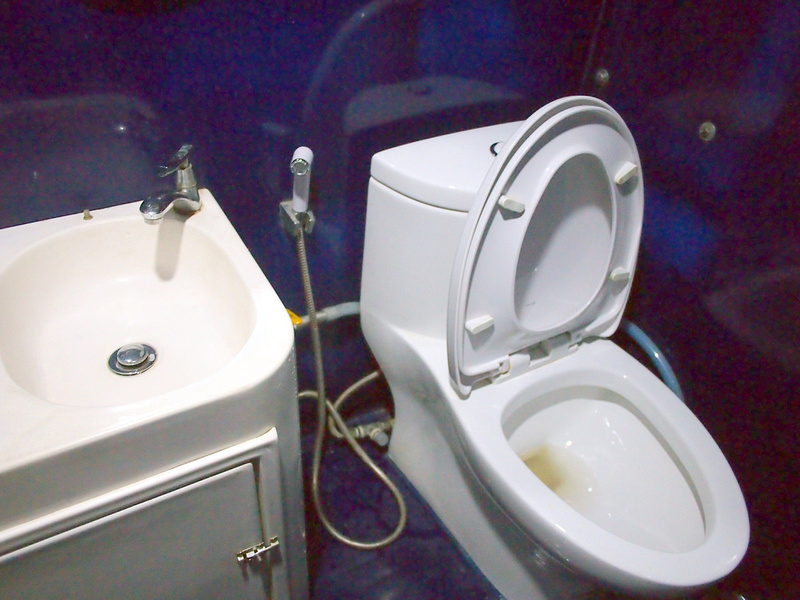 There is a clean western toilet at the back, and there is no snack bar onboard (you get a small bottled water though). Most of the trip is smooth sailing (so to speak) along the rivers. It is only on the last section where the river meets the sea and the boat cuts across the bay that it gets a bit rough. The trip take about 90 minutes and the from the jetty at Vung Tau you can walk to the downtown area of the Vung Tau Front Beach. Here is a map of the Saigon to Vung Tau boat route, which starts on the Saigon River, then joins the Soai Rạp River, and finishes in the Ganh Rai Bay. Traveling is always a good thing in life, it fills your soul. This is the place which is very clean and clear where you can get from Saigon to Vung Tau by ferry. You are never stuck in traffic on the water! 90 minutes to the beach isn’t bad at all. Thanks for sharing. Where we can buy the ticket . 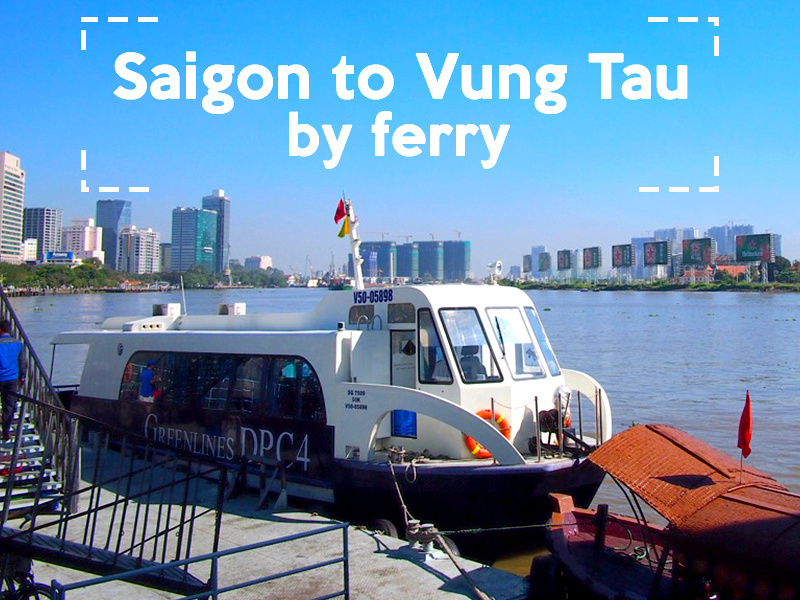 Useful information and tips about Saigon to Vung Tau by ferry. This is so useful! Thank you! Ferries are great! Amazing post, James! Thanks for the info, was wondering why I still see boats going out in my area after the rumored stoppage. I’m wondering though, was there anywhere to park motorbikes for a few days there at the pier in d4? Or did you have to take a taxi/grab etc? It seems the demise of the hcmc to vung tau ferry is because the new expressway makes the journey by road doable in about 90 mins. You can book a ticket from your vung tau hotel straight to the airport and the price is about 100k dong. We travelled from hcmc to vung tau by greenlines, but they cancelled our return ferry at 08:30 because there was not enough passengers and bumped us onto the 10:30 ferry. This would mean we miss our flight so had to go by bus instead. Needless to say the bus takes us straight from the hotel to the airport; saving us time/connections/costs. Hence why the ferry is doomed. We did enjoy the ferry; maybe its a good idea to take it one way, knowing they may bump you to the next ferry if there isnt enough passengers? Which bus company did you take to Vung Tau from HCMC? I see the Futa Bus line schedule and that says 3 hours. i’d much rather take the bus than the so called “Ferry” pictures so graciously posted. Then get the bus to the airport from VT like you did. Can’t afford to have it ‘Cancelled” at the last minute. Thanks! 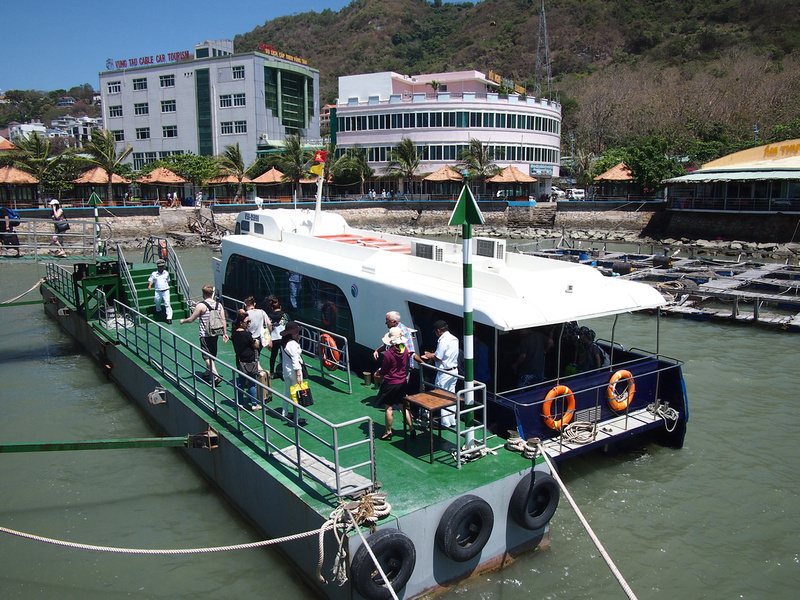 FYI- we took the Greenline Ferry down to Vung Tau and it was fine. Really nice , fast and comfortable and you can sit on aft deck and catch fresh air. No hassle whatsoever. 7 min by taxi to the Ferry from Ben Thang Market area hotel! We did take the highway back as the Ferries only ran in the afternoon ( Chinese NY Eve ) so we had flight to catch but the highway was fine too. Faster for sure ( 1 1/2) but we had no traffic that day as well. Vung Tau was a very pleasant surprise. Nice beaches, super nice people, and beautiful weather ….and NOT CROWDED. No ones told the Chinese about this place yet it seems. The other thing is they take a very direct route. The ferry comes out of the Song Long Tau river, and then crossing the bay is quite bumpy! Is it possible to take one’s touring bicycle and panniers onto the ferry from HCMC to VT? On the back of the boat there is enough space for bicycles, and I would assume that would allow it. It would be a nicer way to exit the city! 1)WHAT IS THE FERRY fare from VUNG TAU to HCMC? 3)IS VINA EXPRESS still operating now? First question..Are these boats or hydrofoils? Second..Does either one of these companies have boats with a front view for passengers the way Vinaexpress foils were designed? Third…lol..Is there a website to purchase online and get the low-priced weekday tickets which, again, Vinaexpress offered? I’m planning a holiday to VN in April. I’ve booked a hotel in Saigon and one a few days later in Vung Tau. I was thinking of going to/from Vung Tau by hydrofoil. Surfing for info has me confused. I’m staying in District 1 in HCM city. Some questions….Should I get a taxi from the hotel to the hydrofoil? Is it possible to take a small suitcase on board? Where do I purchase tickets? It’s not far from District 1 but a taxi is the easiest option. There is enough room for bags. I bought tickets at the dock, and you can also try online, or ask your hotel to help book if the online booking is too complicated (I haven’t tried it yet). The correct name of the city is Ho Chi Minh and NOT Saigon either you like it or not! The locals call it Saigon, like it or not!